This Stunning 5 Bed, 3.5 Bath Ranch is Situated on 3.7 Acres in Wildwood with Nearly 3600 Square Feet of Living Space. The Inviting Entry Opens to the Formal Dining Room. The Great Room Boasts 12' Ceiling & a Wall of Windows w/a Magnificent View. The Gourmet Kitchen is a Cooks Dream w/Custom Cabinets, Granite Counters, Center Island, Stainless Steel Appliances, Double Oven, Spacious Breakfast Room & Opens to the Lovely Hearth Room with Stone Gas Fireplace. The Master Bedroom Suite has a Large Walk in Closet & Offers a Luxury Master Bath w/Double Bowl Vanity and Separate Tub & Shower. The Beautifully Finished Lower Level Adds Even More Living Space with 9' Ceilings, a Huge Family/Rec Room, a Full Bath, 2 Additional Bedrooms, Plenty of Storage Space & Walks Out to the Private 12x12 Patio & Picturesque Yard. 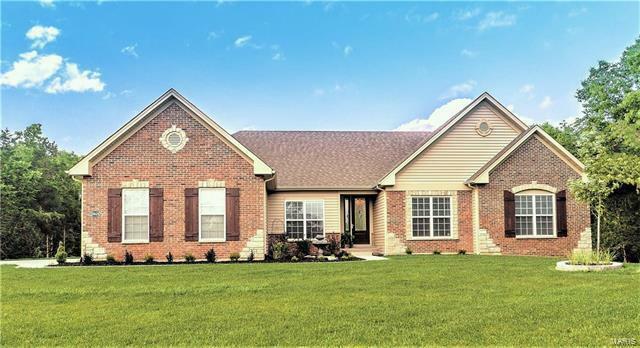 Beautiful Hardwood Floors, 8' Tall Doors, Crown Molding, Low E Windows, 3 Car Side Entry Garage w/Work Area, Water Softener & Lawn Irrigation System. AAA Rockwood Schools.